We love making earrings with seed beads! 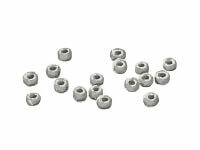 Consequently, most of our DIY earring beading patterns utilize seed beads in them to some extent. Because of that, it was difficult for us to decide which earring designs to include in this DIY seed bead earrings category. We decided that it was probably best to show beaded earrings made with just (or predominately) seed beads. If you want to look at earrings that incorporate seed beads along with other types of beads or beading components, you can view the other earring categories or enter the desired descriptive keywords in our search bar that's located in the top header.